We also learnt some Dzongkha on our way; e.g. Phab means pig, chhee means dogs, tta means horse, etc. Surprisingly, the Bhutanese script has no way of joining letters, which results in extremely verbose spellings (not sure if that makes sense). So tta (horse) is spelled as ra-ta-ta-ta: and Prasad as p:-a:-r:-a:-saad-a-saad. Here’s some audio. I wouldn’t be able to spell my own name till 5th standard. 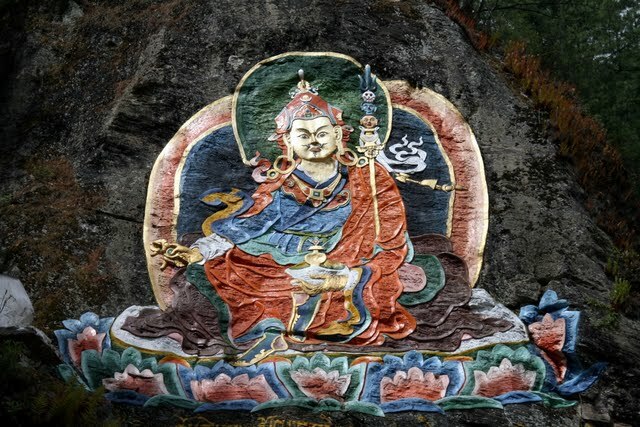 The education system of Bhutan is similar to India: after several levels of school, students head to junior college (only in Thimpu till 2000), after which they pick one of four universities in Bhutan, drop out to work, or go to Indian universities (spending from their own pockets; Bhutanese Govt only sponsors few higher degrees). On our return, we stopped by our tour agent Mystic Bliss’ office where we had a chat with Sambhu Darji. He was quite appreciative of the Indo-Bhutanese ties and mentioned the risk that China possesses to their borders. He mentioned that Bhutan’s is a proxy economy, almost all of it controlled by India. The RBI regulates banks, perhaps the reason why the Indian rupee & Bhutanese ngultrum are at par. We then set course for Punakha which is a 55km rough-drive along sinous mountain roads via the Dochula pass at 10K ft.
Punakha is a warmer place & hence the winter capital; monks still migrate here from Thimpu as winter sets in. We’ve checked into the Zangdo Perli which is not as great as the Thimpu as the Thimpu hotel. It was 2:30pm already, and we had to wait for lunch despite of ordering at 1:15pm itself. Anyway, food was OK; will take a short nap now. We drove to the Punakha dzong which is built on the confluence of two rivers & built thru the vision of a divine man who fled from Tibet with a relic which is now Bhutan’s national relic. He worked to put an end to the long civil war between Bhutanese villages (each village crowned a king) from which 3 kings emerged in Bhutan. The Tibetans attacked Bhutan several times to regain the relic. The death of this political was not announced as the Tibetans greatly feared this man. By the time they knew of this man’s death, Bhutan had united. 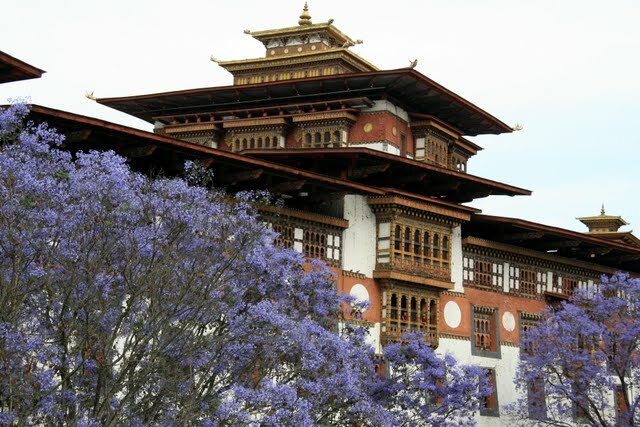 The dzong is surrounded by wonderful violet trees; I think by what I was informed, that’s ‘Jack Coriander’. 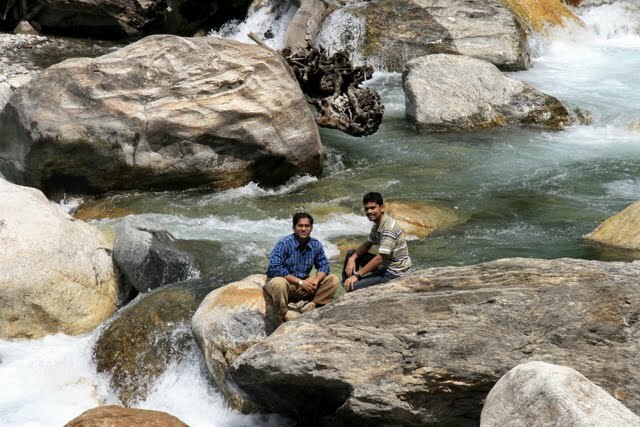 After spending some time on the river bank, we started our search for chicken as our hotel’s restaurant had no stock. The concept of buffet in Bhutan is greatly different from that in India. It’s an extremely limited line-up of main-course dishes with no soup, salad, starters, bread & dessert. Dishes will include pork, beef, red & white rice, fish (in an eatable form if you’re lucky), some pasta and cheese-chilly (a spicy preparation that Bhutanese love to eat with rice & pork). I would suggest going by the menu as we just did.